As India-Pakistan relations have worsened, the IWT – one of the few longstanding symbols of cooperation between the bitter rivals – has come under significant strain. Last September, the Indian government threatened to revoke the treaty (fortunately it didn’t follow through). Several months later, India and Pakistan proposed separate channels of IWT-sanctioned mediation to resolve a dispute over several dams – an unprecedented move that raised additional questions about the treaty’s ability to withstand the deepening political tensions between its signatories. These developments have emerged against the backdrop of an even more serious threat to the IWT – climate change. This phenomenon has contributed, in no small part, to the droughts, floods, and glacial melt that have convulsed both countries in recent years, resulting in dramatic changes to the subcontinent’s hydro environment, from added strain on water infrastructure to new patterns of river flows. Given that the IWT’s river-sharing regulations were drawn up decades ago, before climate change became the serious concern that it is today, some observers contend that it’s time to revise if not jettison altogether an increasingly behind-the-times accord. Lost in this narrative, however, is an underreported reality. Pakistan, the vulnerable lower riparian, has actually made some substantive progress with climate change mitigation policies. In effect, Pakistan has done its modest part to push back against one of the core threats to the IWT. Accompanying the NCCP has been a series of government efforts to incentivize both producers and consumers to embrace renewables. Islamabad has announced generous upfront tariffs to solar and small hydropower producers. It has approved new measures that facilitate the installation of rooftop solar panels for private use, and that enable solar-powered homeowners to receive credits on future energy bills if they allow their excess solar power to be supplied to the national grid. The State Bank of Pakistan and Alternative Energy Development Board have announced a new mortgage financing option that enables homeowners to borrow up to $50,000 against their mortgage to pay for the installation of rooftop solar panels. Meanwhile, the provincial government in Khyber-Pakhtunkhwa has announced a plan to provide solar power to nearly 6,000 off-grid households – while footing 90 percent of the bill. To be sure, this progress is more modest than robust, and formidable obstacles stand in the way of deeper and sustained climate change mitigation efforts. Climate change – as in many other countries – is not viewed by Islamabad as a priority relative to more immediate policy concerns. Solar and wind energy costs are prohibitively high. Additionally, Pakistan’s 18th constitutional amendment, which was ratified in 2010 and devolves more power and resources to the provinces, axed the national environment ministry and transferred authority over environment regulation to provincial authorities woefully unfamiliar with environmental policy. On top of all this, Pakistan’s rapid urbanization – and the increase in heavy industrialization and exhaust-belching automobiles that this entails – ensures relentless environmental stress. That would be a welcome development, because the aging accord deserves a break. This is the IWT, after all, one of the world’s most admired examples of transboundary water management. It is a status it has enjoyed for decades, and – if it can ride out the current storm – for many more decades to come. This article is based on the chapter, “Managing Energy and Climate Policy Challenges in Pakistan: Modest Progress, Major Problems,” in the Handbook of Transitions to Energy and Climate Security. Michael Kugelman is deputy director for the Asia Program and senior associate for South Asia at the Wilson Center. He can be reached at michael.kugelman@wilsoncenter.org and on Twitter @MichaelKugelman. Sources: Dawn, Ministry of Climate Change (Pakistan), Pakistan Constitution Law, Scientific American. 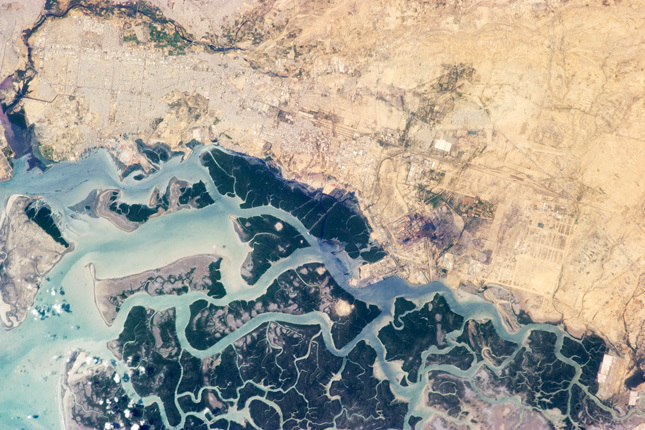 Photo Credit: Korangi Town, part of Karachi, in the Indus River Delta, courtesy of NASA.